Jacques Petit Le Roy, a member of the French resistance, was shot by the Germans in Chevilly-Larue on the eve of the liberation of Paris at the age of 28. He was born in Paris on April 28th, 1916 and joined Saint-Cloud Golf Club in 1924. When he was only 22 years old, he had a handicap of 4, ranking him amongst the top French players of the time. 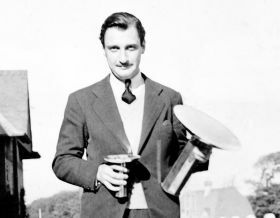 In 1937, he won the Gounouilhou Trophy with the Saint-Cloud team (the French team championship) and was also selected for the French team twice in that same year. The Saint-Cloud Grand Prix, christened the “Jacques Petit Le Roy Trophy,” thus pays homage to the sacrifice of the man and golfer who defended the club’s colours with valour. Mr. Marc Ellenberger, an archivist and documentalist at the town hall of Chevilly-Larue, the town where Jacques Petit Le Roy was shot, has authorized our club to publish his research into the dramatic circumstances of his death. “His family did not know that he participated in the resistance. He was an F.F.I. lieutenant. On August 24th, 1944, Jacques Chaban-Delmas sent him as an emissary to meet General Leclerc in Antony. His mission was to inform him of the urgency of liberating Paris and to give him a report on the situation. Jacques Petit Le Roy left Paris by bicycle but preferred to finish the journey on foot. It would appear that he hid his bicycle with the Fathers of the Congregation of the Holy Spirit – at the mission seminary at the center of Chevilly-Larue. He then met Leclerc and accomplished his communication mission. Faced with the threat of the destruction of Paris, Leclerc handed him an ultimatum for the German commander of Paris, Von Choltitz, warning him that he would have to answer in person for any damage caused to the capital. Jacques Petit Le Roy headed back to Paris on board a military vehicle of the 2nd D.B. in the company of two volunteer soldiers: a driver and a gunner. In order to avoid highway 20, highway 7 and Fresnes, where German troops were still located, the vehicle went through Rungis where a civilian (who had lived in Chevilly-Larue several years earlier) was taken on board to serve as a guide. They then crossed the estates to the east of Chevilly-Larue – then, apparently to fetch Jacques Petit Le Roy’s bicycle, the vehicle headed towards the town center. The vehicle was fired at by several disorderly German soldiers who were leaving a café. The gunner and Petit Le Roy fired back, but were both killed, together with a German soldier. The civilian hid in a ditch and the driver in a café; they both managed to escape and were able to testify as to what happened. The Germans fled with the vehicle after taking the ultimatum from Jacques Petit Le Roy’s body; in the end, this was correctly delivered to Von Choltitz, contrary to what many people believed (including Jacques Chaban-Delmas). The driver was picked up a little later by a military vehicle from the 2nd D.B. which was passing by and the civilian hid with some acquaintances for the night, before heading home to Rungis. On August 26th, 1944, a ceremony was held in Chevilly-Larue to pay homage to Jacques Petit Le Roy and the gunner of the 2nd D.B., Chief Warrant Officer Augustin Dericbourg, who was killed at his side. On October 1st, 1944, the two streets where they were killed were named after them. Jacques Petit Le Roy’s body was taken to Paris and his funeral was held at the church of Saint- Honoré d'Eylau, in the presence of Jacques Chaban-Delmas.